Uchû Senkan Yamato (1977) - Sci-fi-central.com.  Japan  1977  135m   Directed by: Toshio Masuda.  Starring: Gorô Naya, Kei Tomiyama, Shûsei Nakamura, Yôko Asagami, Ichirô Nagai, Taichirô Hirokawa, Takeshi Aono, Masatô Ibu, Osamu Kobayashi, Michiko Hirai, Akira Kamiya, Ken'ichi Ogata, Keisuke Yamashita.  Music by: Hiroshi Miyagawa. In the distant future, the war between the human race and the aliens known as the Gamilons has destroyed the Earth. Radioactive asteroids have devastated the planet making the its atmosphere uninhabitable. In an effort to assist the Earth, Queen Starsha of the planet Iscandar offers the Earth Forces a device that can completely neutralize the radiation. In order to get this device the space battleship Yamato is launched from the remains of its World War II ancestor on a 148,000 light-year journey. 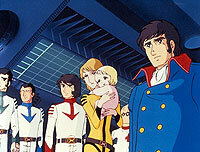 The crew of the Space Battleship Yamato has only one Earth year to travel to Iscandar and back, or the human race will become extinct. 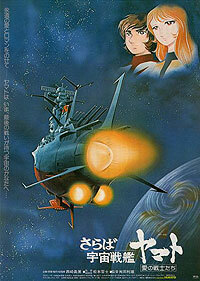 So basically, the first Yamato movie covers the entire Iscandar adventure. Fair enough, allowing theatre-goers to experience the tale in time for the sequel which was released year later...only this is just really badly executed. The single biggest problem with this movie is the pacing. Even knowing it recycles footage from the TV series cannot prepare you for the fact that they did absolutely no additional work whatsoever apart from new narration, meaning they didn't even record any new dialogue - this means that much of the first half of the film races through several key events in a manner that makes it look like the writers of the film really just didn't care. Reducing Yamato's visit to Mars to a mere mention in the fashion of the narrator going "Yamato visits Mars to make repairs" isn't even half as bad as the first test of the wave motion gun and the battle at Pluto receiving almost similar treatment, killing the dramatic tension - and I swear, I've never seen a movie narrate itself through an action scene! Sometimes, they even use the "cliffhanger" narration from the end of an episode! The faster pacing also makes the one-year voyage feel much less epic than it actually was in the TV series, and that in turn draws attention to the awkward fact that Yamato receives grave damage in one battle and is mysteriously repaired by the next scene. How many times does the third bridge get destroyed anyway? With no new animation and a really bizarre priority on what plot elements should be carried over from the TV series at that, the first Yamato movie does not feel like a theatrical feature at all, but a feature-length clip show for television. Review by Andy Steinberg (afnaste@yahoo.com) [IMDB 16 November 2003] from the Internet Movie Database.